I’ve just realized that I’ve never spoke of Bigoli on this blog!!! That’s incredible! Since the first bite I had of this wonderful pasta I was in love! Let’s go back in time… It was our first tour in Veneto, winter of 2002 or 2003, and we were in a nice little restaurant in Verona, near the (hypothetical) Juliet’s balcony (Juliet of Shakespeare’s Romeo and Juliet). It was a mid week lunch, crowded, and while my husband was choosing among the many meat dishes with polenta on the side, I was heading towards the pasta list. I’ve decided for Bigoli con sugo di anatra (Bigoli with duck sauce). Most of the time non-Italians have difficulty to understand that each shapes and types of pasta as a flavour of its own… That duck sauce could only exist WITH that bigoli, not with normal spaghetti, even less with short pasta, may be it could have a little life with fresh egg tagliatelle, but with those bigoli it was just the nearest to perfection I’ve ever tasted! Bring to the boil a large quantity of water. When it’s begging to boil, add sea salt. Add the asparagus and the bigoli. Cook it for 8 minutes. In the mean while, lay the robiola in a big bowl, pour over it a ladle of the pasta water, and mix it. 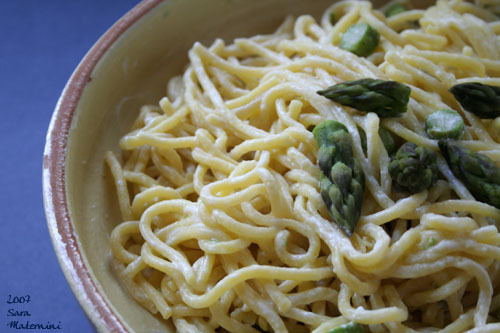 Drain pasta and asparagus, add it to the bowl and mix t well before to serve it. Wow..ho postato un piatto simile anche io oggi!! Però i bigoli non li ho mai provati…mi sa che mi tocca! I have never heard of Bigoli before, but I love learning of new pastas. I don’t think that I would be able to find it here where I live, but I am hungry just looking at your photo!